80-year-old Haze Mabry went to work last month anticipating a busy day of cleaning up trash and bagging garbage. Instead, he was greeted by 800 of his biggest fans. Mabry has worked as a janitor at Pike County Elementary School in Zebulon, Georgia for the last 13 years, a school from which all three of his kids have graduated—but he feels that every single one of the students are “like children of his own”, according to an interview with The Washington Post. 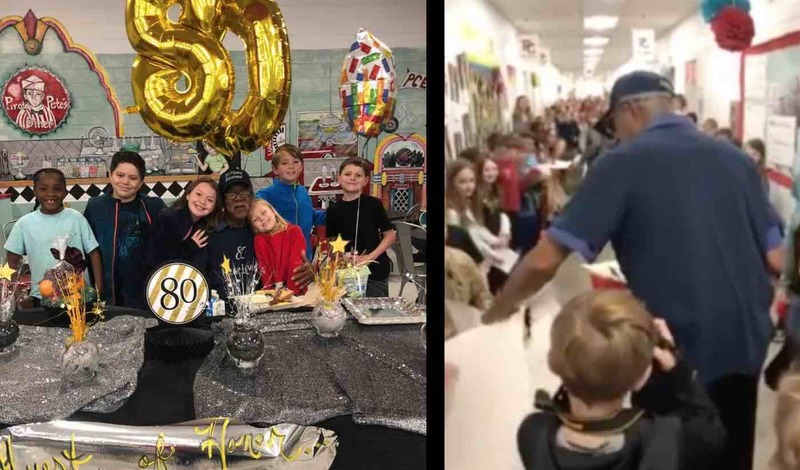 His special attention to the students is why he is considered “the most loved person” in the whole building – which is why the studenta put together a special surprise for him in recognition of his 80th birthday last month. They began handing him cards; singing happy birthday; and holding up banners for his special day. Mabry received so many birthday cards, he had to have a few students follow behind him so they could collect all of the letters and greeting cards into buckets. He was overwhelmed, but hugged every youngster who reached out to him—and apparently has taken extra time to read each greeting card and offer his sincerest thanks to the students. Since the school recently posted several photos to go along with the video footage of the janitorial surprise, they’ve been shared hundreds of times across social media.